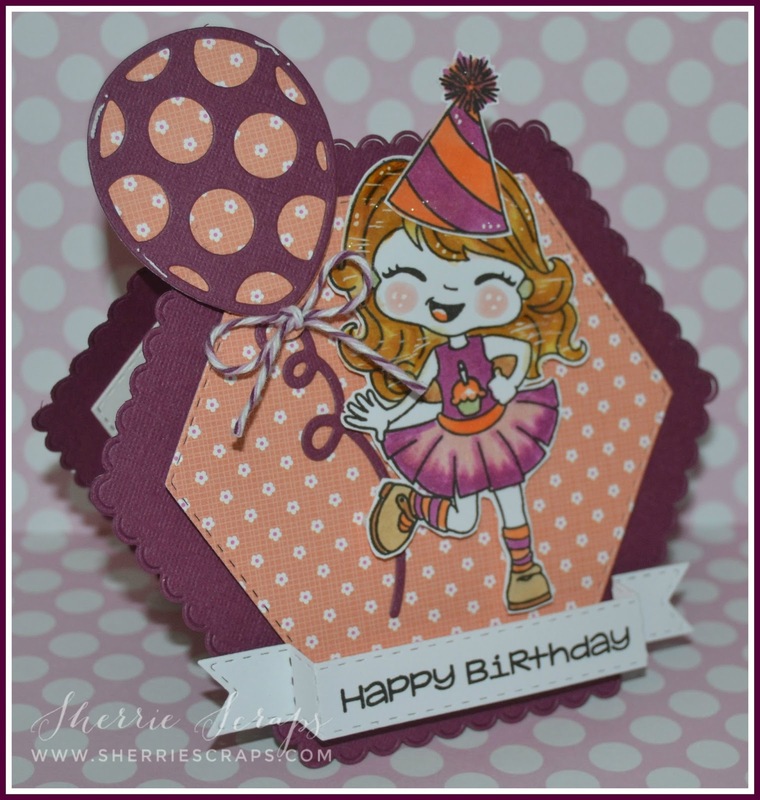 What fun and cheerful cards, Sherrie! That little girl is sure to make anyone smile. The glitter on the image is the perfect touch. 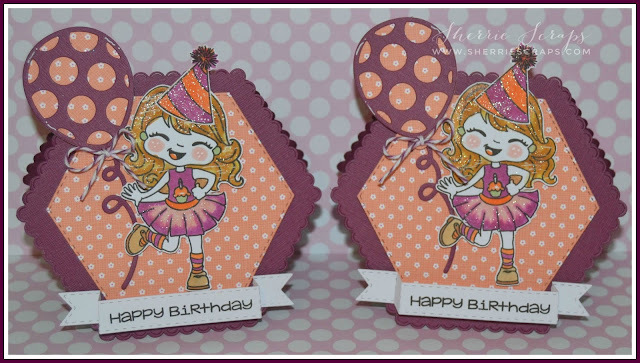 Oh Sherrie, those birthday cards are so adorable! I love the shape of them and that girl is sweet as can be!! Fabulous shaped celebration cards! These are so cute, and a really great shape! Love the scallop edge. Hugs! I absolutely LOVE your beautiful birthday cards!! The birthday girl is so sweet! Love the pretty twine bow too! It's been fun hopping with you today! I so love the shape of your card and the shine! Super with the celebration balloons too - Happy Anniversary Carson's Creations! Happy Day! Thanks for the hop and the awesome!! Blog Candy!! These are so super cute Sherrie. Love your take on them! You did awesome on your projects for the hop! Enjoy your happy weekend! OMYGOSH!!! So CUTE!!!!!! I love love love love those colors!!! Ohhhhhh and Brookie will be a busy girl this summer!! Basketball camp, volleyball camp, regular team volleyball and swimming at the Y!!! Oy!!! LOL!!! Sherri, this card is adorable! Great colors and image. Your coloring is amazing and I love the sparkle that you added! Hello, Sherrie! Your hexagon shaped cards are awesome! I need to break out of the box and make some more shaped cards! These are amazing! The little party girl is so cute! I'm doing the hop today! A big congratulations to Georgiana on 8 years! Awesome prize - thank you! Have a great weekend! Oh my gosh, these are soooo cute!!! Love the colors, gorgeous desiGN, EVERYTHING! Very nice blog hop prize there too! So adorable! And creative! Love the sparkle! This was worth the trip back to visit! I'm happy to follow as I see lots of inspiration here. And thank you so much for the opportunity to win a fabulous prize. Oh My Sherrie... She is a little cutie!! 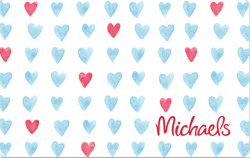 Your cards are adorable and I Love The color combo! The hexagon shape is just so fun!!!! I'm so happy to be celebrating with you and Georgiana today! Have a wonderful weekend!!! Your birthday girl is so sweet! Love the sparkles! Pretty birthday cards! Thanks for the chance to win a great prize! Your birthday cards are so adorable!! Love the shape! 'Have a great day! Such a sweet set of cards! They are absolutely adorable! The colors and patterns you used look so amazing and I love the shaped design! Sherrie , This is just darling! Love your work anyway but this card is simply adorable! Thank you for celebrating Georgiana and her wonderful accomplishment! Love the unique shape of the card. That image really made me smile! Thanks for sharing! This is just so sweet. I really need to get out my hex dies. It's such a great shape. I love the fun shape of your card and the bold colors. You did a great job with the image! So cute--I like the hexagon shape, the colors and the sparkle. Super sweet Sherrie!! Love the glitter in her hair!! Those are just the cutest. The girls so darn adorable. Your cards are so cute! How cute is that image... I’m going to check it out! So cute! Hoping you are well, take care my friend. I hope to find time to stop in more regularly! 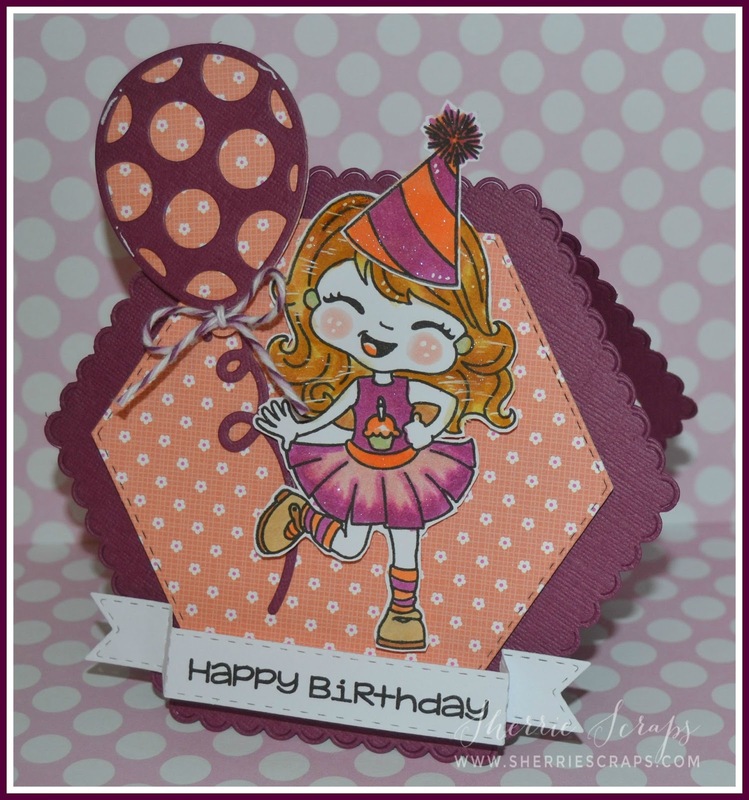 What a great idea to do a hexagon shaped card, it is super cute! Super cute card! The shape is fun and that image is adorbs! Thanks for the chance to win a great prize too! So adorable Sherrie, I just love the design and the little girl is so cute. Super fun hop. Such an awesome prize you are offering. 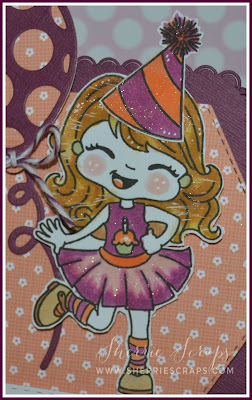 Love your shaped cards, adorable girl stamp. WOW These are really super cute, not only are they shaped but the balloon really does appear to be floating off the card.. I am so happy everything worked out and you were able to be a part of my 8 Year Blogoversary. I could not have a celebration without you since you have been such a wonderful crafty friend over the years. Your project is just perfect too. That little girl made me smile since she looks like she is having a good time. Thanks again! Your cards are just darling!!! !